21 BRAUN, G. / HOGENBERG, F. Malta. Cologne, 1598. Tirage un peu faible. Gravure d�coup�e au filet d'encadrement de la grande planche de Braun-Hogenberg. - Engraving cut at the neat line, taken from a larger sheet. A somewhat weak impression. 160 x 235 mm. � Bird's-eye view of Valletta. From the greatest publication in this genre ! The "Civitates" was compiled and written by George Braun, a Canon of the Cologne Cathedral. Braun gathered together vast amounts of information and draft plans to produce over 500 city views/plans published in six parts between 1572 and 1617. Most of these engravings were made by Simon Novellanus and Frans Hogenberg, many after drawings by Joris Hoefnagel. 22 BOVA, A. Pianta Geografia delle Isole di Malta, e Gozo della Sagra Religione Gerosolimitana di S. Giovanni delineata, ed incisa in quest anno 1761. Ant. Bova, Palermo, 1761. Several folds as issued. Paper slightly age-toned as usual. 2 brown large stains in upper part. Large tear into the plate (12 cm) in lower part left restored. 300 x 425 mm. 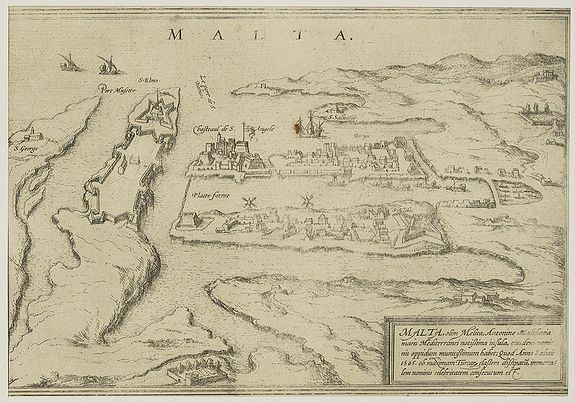 � Rare carte de Malte et Gozo grav�e et publi�e par le pr�tre Antonio Bova (1688 - 1775), qui fut actif en tant que graveur � Palerme autour de 1727-1773. 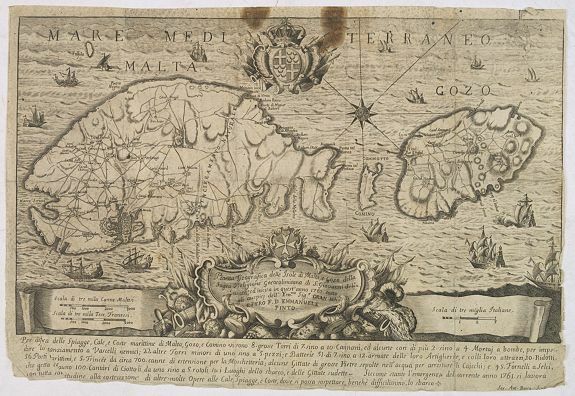 - A rare map of Malta and Gozo printed by the priest Antonio Bova (1688 - 1775), who was active as engraver in Palermo ca. 1727-1773. He produced cartographic engravings, scenery, portraits and holy iconography. His devotional prints are usually signed only by his surname.